Mayor of Dartford Avtar Sandhu MBE Mayor of Dartford Charity Fundraiser will be holding a cocktail masterclass to help raise funds for his 31 Mayoral Groups. The evening will consist of some good times, cocktail making and enjoying your favourite tipples! After a successful curry night in May, the Mayor of Dartford is hoping for another sell out for the Cocktail Making Masterclass. Not only will you be making and enjoying a minimum of three cocktails but you will make them behind a professional bar counter and be taught by a trained cocktail mixologist! The 31 groups the Mayor of Dartford is looking to fundraise for range from local choral societies to volunteer centres to Cancer Research UK. 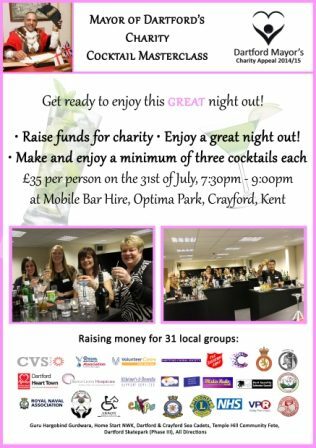 Any money raised from the Charity Cocktail Making Masterclass would help support these local groups in a great way. For more information or to book your tickets, please get in touch with a member of Avtar's team who will be more than happy to book you and your friends a place or provide you with extra information.